Gains or losses on tangible personal property used for business and investment purposes can no longer be deferred under the new tax law under the like-kind exchange rules, applicable for exchanges of business and investment personal property made on or after January 1, 2018. Tangible personal property used for business typical includes vehicles, equipment and airplanes. However, although the application of these tax deferral rules now exclude tangible personal property, like-kind exchanges remain a viable and valuable option for exchanges involving business and investment use real property. Prior to the Tax Cuts and Jobs Act (TCJA), taxpayers could exchange like-kind business property and defer any gain until the property was ultimately sold. Property that was eligible for this tax-free exchange included both real and personal property. Under the old law you could exchange a building for another building or exchange a vehicle for another vehicle (assuming all property is business-use or investment-use property). Under the TCJA, only real estate exchanges are eligible to take advantage of the like-kind exchange rules. When you sell business or investment real property for a gain, you are usually required to pay taxes on the financial gain at the time of the sale. However, IRC Section 1031 provides an exception that allows you to postpone paying tax on the gain if you reinvest the proceeds in similar property as part of a qualifying like-kind exchange. Like-kind exchanges give taxpayers an alternative to taxable dispositions by deferring the tax until the replacement property is ultimately sold. This exchange is typically beneficial if you have a large gain on a piece of property and want to buy a new property without having to sacrifice cash to pay taxes. In addition to like-kind property, the exchange can also include a cash payout, assumption of liabilities or property that is not like-kind. However, including non like-kind property should be carefully examined as it may cause a portion of the gain to become taxable. An often-overlooked (or unknown) option, Section 1031 dates back to 1921 and is meant to encourage business development and productive use of financial gains. It’s important to note that the tax for the transaction is still owed; this provision is merely a deferral until a later date. Section 1031 also requires the use of a qualified third-party intermediary in most deferred exchange transactions. The term like-kind refers to the nature or character of the property and not to its grade or quality. Like-kind real estate includes rental buildings, office and store buildings, manufacturing plants, warehouses, and land. Whether the real estate is improved or unimproved does not matter; for example, unimproved land can be exchanged for an apartment building. A like-kind exchange can also include multiple (more than two) properties. There must be an actual exchange of properties to consider the transaction a Section 1031 exchange. Additionally, both the property transferred and the property received must be held for productive use in a trade or business or for investment, and the property transferred and received must be like-kind property. If all of these requirements are met, it is mandatory to apply the like-kind exchange rules to a transaction. In addition, you must also continue to hold the property you receive in a like-kind exchange, although no specific time frame satisfies this requirement. If the IRS audits your transaction and finds that you transferred the replacement property immediately or shortly after the exchange, it may disqualify the like-kind exchange. If the parties involved in the exchange are related, there is an additional requirement that the replacement property must be held for at least two years. Simultaneous Exchange – In a simultaneous exchange, the relinquished property is sold and the replacement property acquired on the same day, with concurrent closings. The simultaneous exchange is the simplest type of Section 1031 exchange. Deferred Exchange – The deferred exchange is the most commonly used Section 1031 transaction. A deferred exchange cannot simply consist of selling one property and using the proceeds to purchase another (which is a taxable transaction). Rather, the disposition of the relinquished property and acquisition of the replacement property must be mutually dependent parts of an integrated transaction constituting an exchange of property. 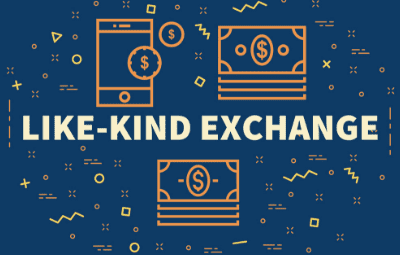 Taking control of cash or other proceeds before the exchange is complete WILL disqualify the entire transaction from like-kind exchange treatment and make ALL gain immediately taxable. You can avoid premature receipt of cash or other proceeds by using a qualified intermediary or other exchange facilitator to hold those proceeds until the exchange is complete. You have 45 days from the date you sell the relinquished property to identify potential replacement properties. The identification must be in writing, signed by you and delivered to a person involved in the exchange (such as the seller of the replacement property or the qualified intermediary). Notice to your attorney, real estate agent, accountant or similar person acting as your agent is not sufficient. The replacement property must be received and the exchange completed no later than 180 days after the sale of the exchanged property, or the due date (with extensions) of the income tax return for the tax year in which the relinquished property was sold, whichever is earlier. The replacement property received must be substantially the same as property identified within the 45-day limit described above. Reverse Exchange – The reverse exchange option involves the acquisition of replacement property before the relinquishment of the first property. Somewhat more complicated than a typical deferred exchange, the replacement property must be parked with an exchange accommodation titleholder for no more than 180 days (during which time you must dispose of the relinquished property). Construction/Improvement Exchange – The construction exchange allows real property owners to use exchange proceeds to build on land or improve an existing property. The construction/improvements exchange is often used to acquire a ‘fixer’ and do improvements on the existing structure. The pitfall with a construction/improvement exchange lies in the fact that all exchange funds need to be spent on or before the 180th day of the exchange. Remember, gain is deferred but not forgiven in a like-kind exchange. You must calculate and keep track of your basis in the new property you acquired in the exchange. The basis of property acquired in a Section 1031 exchange is the basis of the property given up with some adjustments. This transfer of basis from the relinquished to the replacement property preserves the deferred gain for later recognition. When the replacement property is ultimately sold (not as part of another exchange), the original deferred gain, plus any additional gain realized since the purchase of the replacement property, is subject to tax. When Should You Consider a Like-Kind Exchange? You intend to replace your current real property with similar property and hold the property. The property being disposed of has appreciated in value enough that a sale would result in a significant tax liability. You have non-depreciable property that produces no income, and you want to obtain depreciable, income-producing property to generate additional after-tax income (for example, if you’re already retired). You want to convert from trade or business real property (e.g., active in management) to investment real property (e.g., triple net lease property, in which expenses typically paid by the landlord are paid by the tenant as rent) or vice-versa. When Should You Avoid a Like-Kind Exchange? You have current-year losses or loss carryovers (capital, net operating, charitable, etc.) that can be used to offset gain resulting from a taxable disposition. Paying tax on the gain in the current year may be more beneficial than deferring the tax because of events (such as increases in your future taxable income, rising tax rates, or changes in the tax treatment of capital gains) that would produce future additional tax. You are disposing of property with a built-in loss. A nontaxable exchange also defers losses, so it would prevent you from recognizing the loss now. A wide disparity exists between your capital gains tax rate and your ordinary income tax rate. Your gain is passive income that can be used against current or suspended passive losses. You don’t plan to hold the replacement property for long. Taxpayers should be wary of individuals promoting the improper use of like-kind exchanges. Typically they are not tax professionals. Sales pitches may encourage taxpayers to exchange non-qualifying vacation or second homes. Additionally, many promoters of like-kind exchanges refer to them as “tax-free” exchanges and not “tax-deferred” exchanges. Taxpayers may also be advised to claim an exchange despite the fact that they have taken possession of cash proceeds from the sale. A like-kind exchange can be tricky, so it’s important to consult with your real estate CPA to make sure you follow the necessary guidelines. With a little research and careful planning, you can leverage this tax deferral to help you reach your business goals.